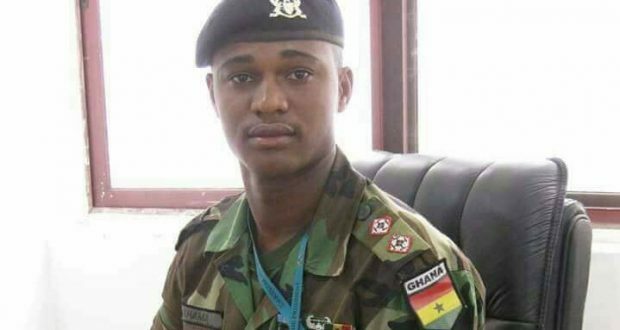 It has emerged that the Junior Military Officer, Captain Maxwell Mahama who met his untimely death after he was lynched in Boase, a mining community in the Upper Denkyira West District of the Central Region, was a nephew of ex President John Mahama. The ex President is a brother to the deceased soldier’s father, Captain (Rtd) Chubby Adam Mahama. The former Ghanaian leader confirmed this in a tweet when he expressed his condolences to the retired captain on the death of his son. Captain Maxwell Mahama, the only son of his mother who was a Commander of a Military Detachment in Boase was killed by the inhabitants when he went for jogging Monday morning on suspicion he was an armed robber. Two women reportedly saw a pistol on him, and because of an armed robbery incident that had happened recently in the area, raised alarm and called the assemblyman for the area who organized the youth of the town to lynch him. Captain Maxwell Mahama who was not dressed in military uniform at the time pleaded several times that he was not a criminal, but the angry residents kept hitting him with cement blocks until he died. They then burned his body. Meanwhile President Nana Akufo Addo has assured that persons involved in the killing will be arrested and dealt with ruthlessly according to the law. In a tweet, the President expressed his condolences to the family of Captain Mahama on their tragic loss. Scores of youth in Boase have been rounded up in a swoop Tuesday, by soldiers who have stormed the town following the killing of the junior Military officer. The youth are being held for their alleged complicity in the killing of the soldier. About 35 troops are presently in the town to establish the circumstances leading to the lynching of the young officer.